PT PP Urban - PP Urban is a rapid growing construction services company in Indonesia which has ISO 9001, ISO 14011 and OHSAS 18001 certifications for the entire operations. PP Urban has core business competencies in urban development, construction and precast concrete product. 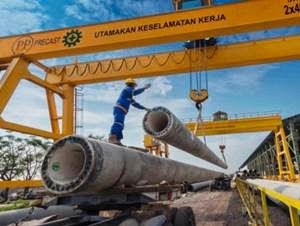 PT PP Urban is directly-owned subsidiary company of state-owned construction firm PT Pembangunan Perumahan (Persero) Tbk or PT PP (Persero) Tbk. At present, 99.99% of its stakes are held by PTPP Group. Based in Jakarta, PP Urban now has 2 factories, located at Serang Banten and Purwakarta West Java. PP Urban's head office is registered at Plaza PP Lt 2, Jl TB Simatupang No 57 Pasar Rebo, Jakarta Timur 13760. According to information found in the Company's websited as cited by JobsCDC.com, PT PP Urban was first established in 1989 as PT Prakarsa Dirga Aneka and initially owned by PT PP (Persero) Tbk Welfare Foundation. In 2008, the company changed its name to PT PP Dirganeka. Later in 2013, PT Dirganeka acquired by PTPP Group and transformed into PT PP Pracetak. The name of PT PP Urban officially launched in 2017. Minimum Diploma or Bachelor Degree (D3/S1) majoring in Architecture Engineer with GPA ≥ 3.00. Minimum 1 year of experience as Drafter in Property or Construction company. Minimum Diploma or Bachelor Degree (D3/S1) majoring in Accounting from State University (PTN) with GPA ≥ 3.00. Minimum 3 years of experience in the field of Accounting. Fresh Graduates are welcome to apply. Minimum Diploma Degree (D3) majoring in Civil Engineering (Building Construction) with GPA ≥ 3.10. Male, maximum age of 40 years old. Minimum Bachelor Degree (S1) majoring in Civil Engineering, Urban Planning, Architecture Engineering, Economy / Business Management. Have ability and experience to conduct Feasibility Study. JobsCDC.com now available on android device. Download now on Google Play here. Please be aware of recruitment fraud. The entire stage of this selection process is free of charge. PT PP Urban - D3, S1 Fresh Graduate, Experienced PTPP Group October 2018 will never ask for fees or upfront payments for any purposes during the recruitment process such as transportation and accommodation.